Form 1099 : Does It Apply To Your Business? One of the most frustrating things about being a new business owner or a microbusiness, is that many times you don’t know what you don’t know. And everyone else assumes you know everything you need. In my early years, I would find out about a license, tax, or something else I was supposed to be doing after I received a penalty or notice…or sometimes I was lucky to learn something through casual conversation. I know I still don’t know everything. However, one thing I did learn early on was to make the nice ladies at the Department of Revenue my friends! 😁 One of the areas that took me by surprise was related to Form 1099 and W-9. Note: I am NOT a professional tax consultant. I am providing basic information to get you started. Please seek the advice of a CPA or tax professional for your specific situation. WHAT IS FORM 1099 FOR? Form 1099 is called an information return. Just as a W-2 provides information to the IRS regarding wages earned by an employee, so the form 1099 provides information to the IRS for payments rendered to non-employees or unincorporated business. Basically, any time you pay someone for services in the amount of $600 or more, and they are not a corporation, you must file a Form 1099 with the IRS, and send a copy to that person or unincorporated business. For example, here’s one that I missed for awhile…if you pay rent to a landlord, even if it is an office space or other commercial building, you must file a 1099 to notify the IRS. In addition, you must provide a copy of that 1099 to the landlord by January 31. The person who built your website is self-employed (or part of an LLC). You pay someone to assist you with a project. You paid models for a business photo shoot. Someone is paid to do your bookkeeping. You get the idea. Any time you pay someone to do any work for you and they are 1.) NOT YOUR EMPLOYEE or 2.) NOT INCORPORATED and you pay them more than $600, you must file Form 1099. WHAT IF YOU PROVIDE SERVICES? On the other side of the coin are the people who provide the services to individuals and business. 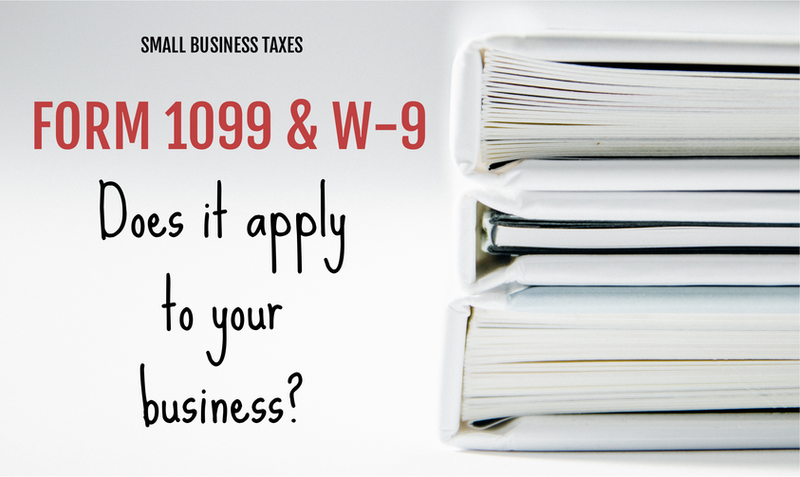 While you do not have to file the 1099-MISC form, you DO need to provide each of your clients a W-9. This is used to complete the form 1099. Once each client has returned the 1099 to you, report the income on your Schedule C when you file your taxes. Every year, please make sure you provide a new copy to existing clients that have paid you more than $600 for your services. I’ve included a couple of links in this article. I recommend doing some research to determine if there is anyone that needs a 1099 from you, or if you need to submit a W-9 to a client. Also, consult an accountant or tax professional to make sure you are getting all the necessary forms filed. If you work from home, are a micro/small business, self-employed, or non-employee…you will need to fill out a W-9 to the people who hire you AND YOU RECEIVED $600 OR MORE IN COMPENSATION. Whether you are a graphic designer, social media manager, photographer, landscaper, cleaning service, web developer, writer….whatever it is you do, keep track of how much someone is paying you. IF you have paid anyone to clean your house, business, provide child care, or provide any services for your business and they are NOT AN EMPLOYEE AND YOU PAID THEM MORE THAN $600, then print out the 1099-MISC and fill it out. You will need their W-9 to do so. And don’t forget…..send a 1099 to your landlord for office/retail space that you rent!